RVnGO is America's best marketplace to find RVs to rent in Maryland. Find your RVnGO! The Maryland Eastern Shore is the state's most popular attraction. Noteworthy towns, shorelines, and friendly city draws tourists from all over to relax and unwind. Nearby attractions include rowing, swimming, biking, fishing, bird watching, and golf. There are waterfront festivals and competitions up and down the coast for individuals to partake in. The Eastern Shore is an outstanding drive for your Maryland RV rental. Six Flags America is the place to go for excitement and adventure. This amusement stop includes more than one hundred rides, various shows, and the biggest water park in the region. Six Flags is a great spot for family fun. Grown-ups will be excited by rides, like the Wild One, Joker's Jinx, Superman's Ride of Steel, and Penguin's Blizzard River. Younger kids will have a great time at the Looney Tunes Movie Town where they can meet and connect with characters, like Bugs Bunny. There is nothing better than spending a day at Six Flags America! The city of Baltimore is rich with history and views, spend the day investigating and exploring the city. The Inner Harbor offers something for everyone, including eateries, the National Aquarium, Harborplace, and Maryland Science Center, which includes a planetarium and observatory. In time past it was a neighborhood populated by mariners, dockworkers, and the most daring of individuals. In 1980, Harborplace opened and transformed the Inner Harbor in Baltimore to become an amazing sightseeing hub. Situated around 37 miles from Baltimore, The Merry Meadows Recreation Farm is settled in a 375 acre lot where you and your family can spend quality time together. In addition to making the most of its various amenities, it is minutes from many incredible attractions. It has 110 accessible spaces, 105 of which are full hookup spots with tables, fire rings, and space for slideouts. Services include a swimming pool, fishing, horseshoes, tennis court, food trucks, mini golf, game room, cafe, staple goods, wi-fi web access and satellite TV, RV stockpiling and supplies, and a ton more for your camper rental in Maryland. Maryland Bacon Festival! Only 25 minutes from Six Flags America, Cherry Hill Park has 350 accessible full hookup locales with yards, BBQ flame broils, fire rings, tables, and space for slideouts. It is filled with comforts including wi-fi web access and digital TV, warmed pool, whirlpool, sauna, play area, game room, nature trails, rec hall, mini golf, cafe, staple goods, golf carts, and much more for your RV rental in Maryland. You are open to camp at the Cherry Hill Park anytime of the year in a Class A RV rental in Maryland. If you are planning to cruise around Maryland in late July, visit Baltimore and enjoy the African American Festival. It is a two-day family-oriented celebration of heritage and culture which has been a local tradition for over 30 years. It features an assortment of arts, health and wellness exhibits, an empowerment tent, shows, games, more than 150 trading stalls, live music, skill classes, and more! The celebration is open to the general public. If you're a bacon lover, you cannot miss the Maryland Bacon Festival, which takes place each April in Baltimore. The celebration is high on the hog featuring bacon confectionary delights, bacon testing, and all bacon food, bacon cooking shows, bacon eating challenges, bacon cooking rivalries, and a bacon-themed kid's zone. You can also rock out to live music from some of the best local groups who are bacon lovers as well! Bring home some bacon from the Maryland Bacon Festival! 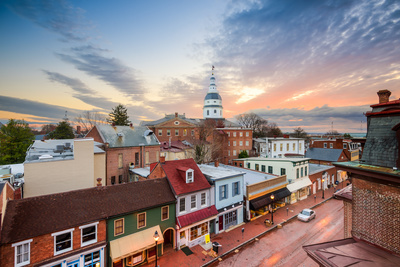 Whether you indulge in bacon bonanza, gobble some Maryland crab cakes or sail around the harbor, you are sure to enjoy the sights, sounds, and history. Book an RV rental to Maryland with at RVnGO and have a fabulous time in Maryland!